Adventure Island Playground | KaBOOM! 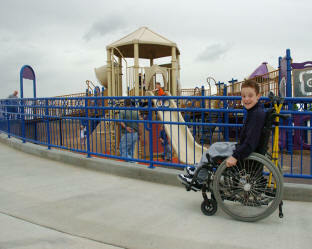 Children of all abilities have a wonderful place to play at Idaho's Adventure Island Playground. The vision for Adventure Island began nearly a decade ago when Angela Lindig had a dream that her community, in The Treasure Valley, could build a universally accessible playground. She shared her vision for an inclusive playground with neighbors, professionals, and friends and by early 2000, a small and energetic committee had formed. The Adventure Island committee is made up of dedicated individuals from diverse backgrounds who worked as a team to brainstorm ideas and raise funds. 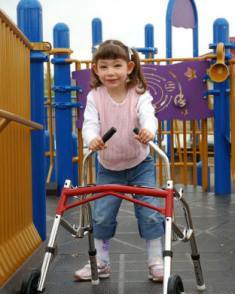 Angela, mother to a daughter with a disability, leads Adventure Island Playground with enthusiasm. She is the public face of the project and also its biggest cheerleader. Community members, advocates, organizations for people with disabilities, and landscape architects all brought new perspectives, motivation, and specialized information to the group. Jim Everett, CEO of the Treasure Valley YMCA, inspired the team in 2000 when he said: "We need to dream big, we can always scale back if necessary." Together they dreamt big and never looked back! People throughout the entire Treasure Valley also stepped forward to make this accessible playground a reality for their community. Saint Alphonsus Regional Medical Center (home to an outpatient therapy program for children with disabilities) provides funds, services, staff, and awareness. The City of Meridian donated the land, ongoing funding, and maintenance. Volunteers helped during the planning, building, and fundraising. Angela along with Jennifer Bach, a volunteer committee member, traveled to a KaBOOM! UPlay workshop to learn about community builds. They rallied tremendous support and in August 2004, held one of the largest community builds ever! Over 300 community members came together to build the first phase of the playground in a single day. As plans for Adventure Island took form, Angela and the community realized their message was not just about the playground but also about inclusion. "Basic human rights," says Angela. Adventure Island is for EVERYONE and a place where children naturally learn about diversity without needing to be taught. Adventure Island Playground is about the power of play to bring a community together. Angela and Darin Lindig, parents to Amber, age 3 and Ryan, age 2 were in the car traveling on their family vacation. Angela was reading a story in Family Circle magazine about a family with two children. They were playing at a playground that had been designed so that children with disabilities could interact and play right along side their peers and siblings who were developing typically. It was the first time the family had experienced a place where they could all participate. Angela was struck by the concept and showed it to her husband. It had been created back East, but, she immediately thought that maybe something like that could happen in Idaho too. Upon arriving home from vacation, Angela began to do a little research in the hopes that a facility either existed or was in the planning stages locally. She couldn't find anything local, but she did find information about an organization that consulted on these types of projects. At this time, Angela was serving on her Regional Infant Toddler Committee which was comprised of professionals who collaborate to insure that all children who need early intervention are served. She took the information she had compiled to a meeting in the hopes that perhaps one of these professionals would know of a resource in creating such a facility. She also took the information to a local parks and recreation public meeting where their hired consultant told her that she was trying to sell a product. She felt defeated and put the whole thing on the back burner. Her daughter Amber has a disability and at that time, Angela was still coming to terms with her own grief surrounding that reality. She decided it wasn't meant to be, at least, not for her. A year later, the local newspaper ran an article on a universally accessible playground being created in Florida. Angela's phone began to ring. People wanted to know if that was her project. "Did you do this? Is it local?" they questioned. Then a good friend who was involved in fundraising came to say she'd help raise the funds if Angela wanted to try to pursue creating a project like this in Idaho. From there, Angela began calling people and telling anyone who would listen about her idea and getting as many people involved as possible. Thirteen people gathered around the Lindigs' kitchen table in July of 2000. They discussed their ideas and together watched a video of Shelley Kramm, who founded Hadley's Park in Maryland. Each person around the table was immediately inspired. Jim Everett, CEO of the Treasure Valley YMCA, said "We need to dream big, we can always scale back if necessary." And from that moment, that's what they did. Each person became part of a core committee, spreading the word and looking for help in the planning process. The Land Group, Landcape Architects, agreed that they would help with a preliminary design. Roger Howard from the Living Independence Network Corporation joined in and suggested creating focus groups to determine the overall design. Over the course of that winter, each group met individually, compiling research data and their own ideas. Then, they all convened on a Saturday to pull their ideas into one. From there, The Land Group, Landscape Architects created conceptual drawings. Angela, in the meanwhile, was doing the much needed behind the scenes research regarding childhood development, educational benefits, and gathering statistics regarding people with disabilities in Treasure Valley. As the drawings were coming together in the spring of 2001, the group realized that they would need to partner with a larger agency or incorporate as their own non-profit entity. Many of the parents involved in the process had children that attended the JumpStart program through Saint Alphonsus Regional Medical Center (an outpatient therapy program for children with disabilities). Many of the therapists who worked there were also involved in the planning process. Angela met with Annette Park at the Saint Alphonsus Foundation, who immediately embraced the idea. She recognized that this type of facility complements the tremendous work the hospital does through their rehabilitation programs as well as in keeping children healthy through play and exercise. Annette spoke with her board of directors and Saint Alphonsus joined as a partner. They have donated staff and services through the entire process as well as granted funds. Saint Alphonsus has also provided many opportunities to spread awareness about the project. By late summer 2001, the group was ready to begin a fundraising campaign. Unfortunately, this coincided with the disastrous events 9/11; halting the process for obvious reasons. Angela continued researching potential funding sources during this time and began a plan to spread awareness through public presentations. More and more people were becoming aware of the concept. Angela was being asked to speak to many different groups, not only about the playground, but more often, about inclusion, diversity, and advocacy. The greater message of the Adventure Island Playground was beginning to take shape and it was one of education, recreation and inclusion--basic human rights. Around this same time, thanks to the involvement of then Meridian City Council member Tammy DeWeerd, Angela received a call from the Meridian Parks and Recreation department telling her that they not only had land, but that they would provide ongoing funding and would commit to maintaining the project upon completion. They viewed it as the gem within the parks system. Tammy DeWeerd has since been elected Mayor and has been a strong supporter of Adventure Island, sharing the profound impact it's having on her community with other cities throughout Idaho. Fundraising eventually began to take shape by spring 2002. Angela along with community volunteer Jennifer Bach, traveled to Chicago to attend KaBOOM! 's three day workshop on developing a Community Build. They learned exactly how to involve the entire community in actually building the main play structure from start to finish in one day. When they returned, they began sharing this information with others. The volunteer committee members knew that by involving the community in the build process, they would develop a sense of ownership to the project. It wouldn't be labeled as The Handicapped Playground. People would understand that it was for EVERYONE. By September 2002, Angela had gained the support of many community leaders, including Idaho's First Lady Patricia Kempthorne who helped spread awareness by joining in a local news program with Angela and Mayor DeWeerd. Each participated in the Groundbreaking Ceremonies held September 10, 2002. Within one more year, after a great deal of public speaking, mailings, grant writing, and word-of-mouth grass roots fundraising, hundreds of individuals and organizations had stepped up to donate their time and services to the project. The efforts culminated at the end of August 2004 when more than 300 volunteers came together and built The Grand Voyage by hand in one day. The day was a perfect success. For weeks after, as they waited for the surfacing to be poured, people came to stand by the fences. Showing their families just exactly which component they had put together. Angela spent time at the playground just to talk to people as they came to look through the fence. They each had a story. Pride in their accomplishment is what keeps motivation for the project going. It's what drives Angela to continue forward knowing shes making a difference. 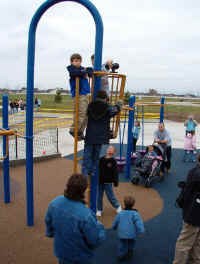 The first phase of the playground opened in November 2004 and has been enjoyed by thousands since. Angela continues to raise funds, plan events, and speak to anyone who will listen about the importance of this facility to the future of the community. She anticipates completing the playground within the next year, but recognizes it may take two. In addition, one of the committee's goals was to create programs at the playground that would provide natural interaction for children of all abilities. 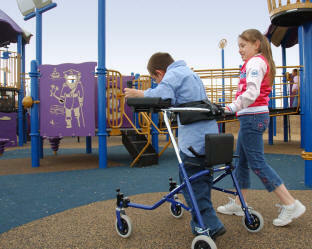 They implemented a program that was modeled after a similar playground in Los Angeles called Shane's Inspiration. The program is called Treasure Seekers. Four times per year, children come to the playground to participate in a free, themed playdate in which they are randomly paired with another child of similar age. Each child chooses a craft activity and receives a treat at the end. They also bring their own lunch and have a picnic. This program is one that will provide all children with the opportunity to meet a new friend who may be different them on the outside but very much the same on the inside. Kids (and parents) who participate will grow in an environment where diversity is celebrated. They will be the next generation where this important message of inclusion will not have to be taught--it will just simply be. 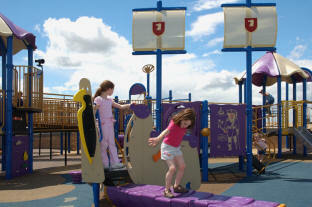 Click here to find out more about Adventure Island Playground. See photographs, press coverage, video footage, and much more!